Ernest Jabulani Mchunu may be 75 years old, but the Alexander township born youngster had two goals: to become a manager and to visit America – almost impossible ideals for a black child in South Africa at the time. 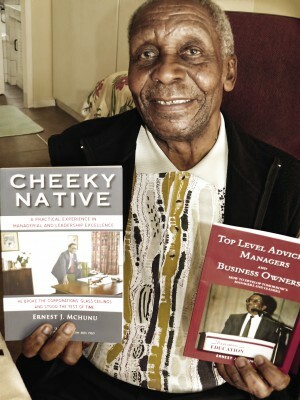 Mchunu was the first black person to obtain a Diploma in Marketing at the Institute of Marketing Management. 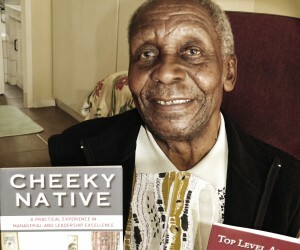 He obtained a Management Diploma at Wits University in the early 1980s. He is the author of two books, Cheeky Native (2010) and Top Level Advice to Managers and Business Owners (2010), both available from Amazon.com. Mchunu led the Black Management Forum for a decade, from the late ‘70s; and was elected a Fellow of both the South African Institute of Management and the Institute of Directors Southern Africa. After Matric, he landed a job as a filing clerk for a car dealership. One day, while cleaning the manager’s office, he asked what he could do to become a manager, and was laughed at. However, his meticulous work and ambition got him noticed, and when the company’s accountant obtained a job at Empisal Knitting Machines, he took Muchunu with him. It was there that the young man stole a book on management from the boss’ shelf. Its absence was noted, but rather than reprimanding the youngster, the manager gave him access to more books. Sales House, owned by Edgars, began making waves at the time, targeting the black market – allowing customers credit and even letting them try on clothes before buying them. And so his dream of becoming a manager became a reality, as he helped grow the Sales House brand and ended up managing a store in a ‘white area’ until his presence was brought to the attention of the authorities and he had to be redeployed. It was political pressure in America that saw Mchunu joining Coca-Cola. The beverage giant was having problems with activists in America who were not happy with the fact that although black South Africans were loyal consumers of Coke, there were no black managers in the country. As the first black manager in South Africa, it was his responsibility to grow the brand in the townships. He was sent to America to learn the Coke philosophy – so his second goal, of visiting the Land of Stars and Stripes, was achieved. A remarkable career with Coca-Cola saw Mchunu visiting several countries and spending time at the University of Coca-Cola in Atlanta, Georgia. In 1989, he left Coca-Cola and started his own company, Ernest Mchunu and Associates, which aimed to develop black managers and companies.